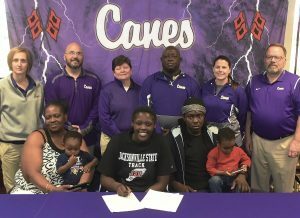 RANDY PARKER/THE DAILY TRIBUNE NEWS Cartersville High School senior London Shaw recently signed with Jacksonville State University in Jacksonville, Alabama, to throw for track and field team. On hand for the signing were, front row, from left: Latarsha Shaw, mother; Rian Shaw, nephew; Ken Shaw, brother; and Kenonta Shaw, nephew. Back row: Shelley Tierce, CHS principal; Dutch Cothran, coach; Cindy Moore, coach; Emerson Bridges, coach; Shannon Suarez, coach; and Darrell Demastus, CHS athletic director. When the Cartersville girls track and field team needed an injury replacement for the 4×400-meter relay race, head coach Emerson Bridges turned to one athlete he knew wouldn’t turn down the opportunity: senior London Shaw. Bridges said Shaw hadn’t ran a 400 since eighth grade, and she doesn’t fit the profile of a runner. A center on the basketball team and middle blocker on the volleyball squad, the 6-foot Shaw is on the Canes track and field team to throw. She does that exceedingly well and signed to compete for the Jacksonville State track and field program during a March ceremony in the Cartersville High School media center. Bridges and Cartersville assistant track and field coach Shannon Suarez both spoke that day about Shaw’s high upside. Despite having plenty of raw strength, they are excited to see what she’s capable of at the next level. Said Suarez, “We’re exceptionally proud of her, and she’s come a long way in four years. She’s grown personally, athletically, and really put some time into getting to where she is today. We’re pretty proud of her for that. That’s a scary thought, considering Shaw finished in the top eight in both the shot put and discus at the Class 4A state meet in 2018. Her discus has improved dramatically this season with Shaw breaking the school record and currently holding the longest throw in 4A this season. In the recent Bartow County Championships, she threw 123 feet, 7 inches — 15 feet further than her eighth-place throw as a junior at state. Shaw said she hopes to get up to 125 feet in the discus and 41 feet in the shot put. (She placed third in the latter event last year with a throw of 38 feet, 7 inches.) Her increased distance this season can partly be attributed to her improvement in the coachability department. “She’s great at leading, but she’s hard to be led,” said Bridges, who is also an assistant on the girls basketball team. Shaw admitted as much but knows learning the lesson now will only help her when she gets to Jacksonville State. 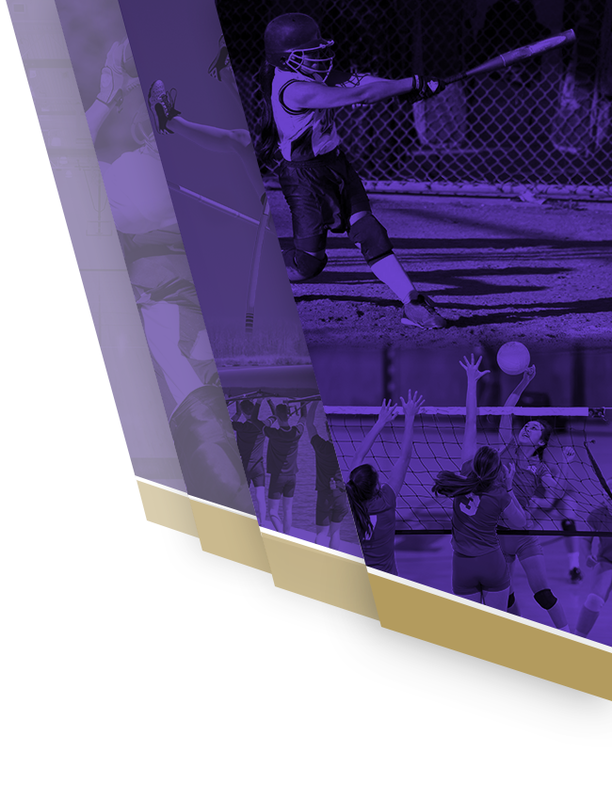 While she still has a few months left of high school and some major goals left to check off, Shaw seems ready to face the challenge of becoming a college athlete. 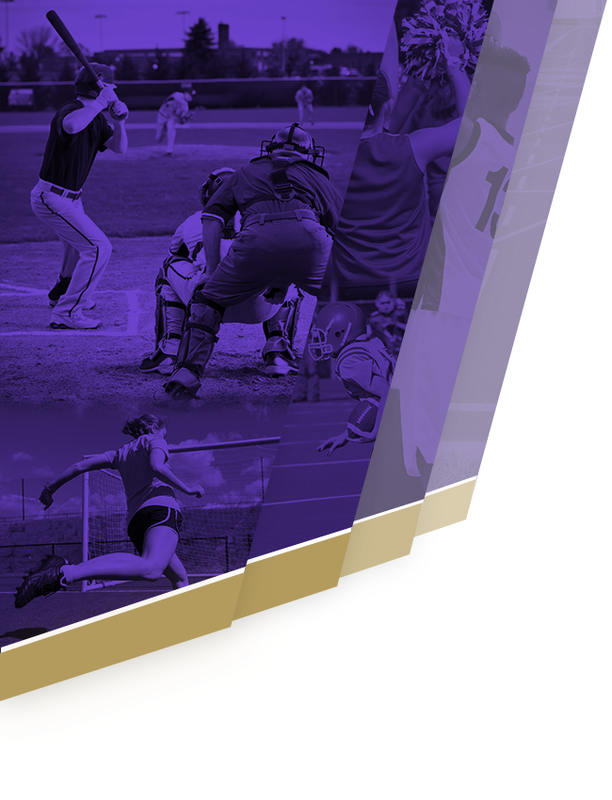 In some regards, it will be easier than being a high school athlete, because Shaw is part of an increasingly shrinking pool of three-sport athletes. Having spent just a few months out of the year trying to hone her throwing craft, Shaw could see massive results once she’s a full-time track and field athlete. Shaw will become the latest Cartersville track and field star to join the Jacksonville State program. In fact, former Gamecocks hurdler Blake Perry has returned to help the Canes this season at her alma mater. So why have so many Cartersville products done well there? Shaw thinks it might have to do with the coaches being able to get the best out of their athletes. Her time with the Canes is coming to a close, but few athletes in the county are more loved by their teammates than Shaw. The “gentle giant,” as Bridges put it, reciprocates that adoration time and again. It may not be too often that she’s asked to fill in during a relay race, but the fact that Shaw would be willing to do that when called upon speaks volumes to her dedication to the team.